Led by scientists at Pacific Northwest National Laboratory, researchers discovered how water changes the channel of the catalyst known as H-Beta zeolite. The team found that adding water changes the environment around the catalyst's aluminum atoms, which are at the heart of converting biomass into fuel. 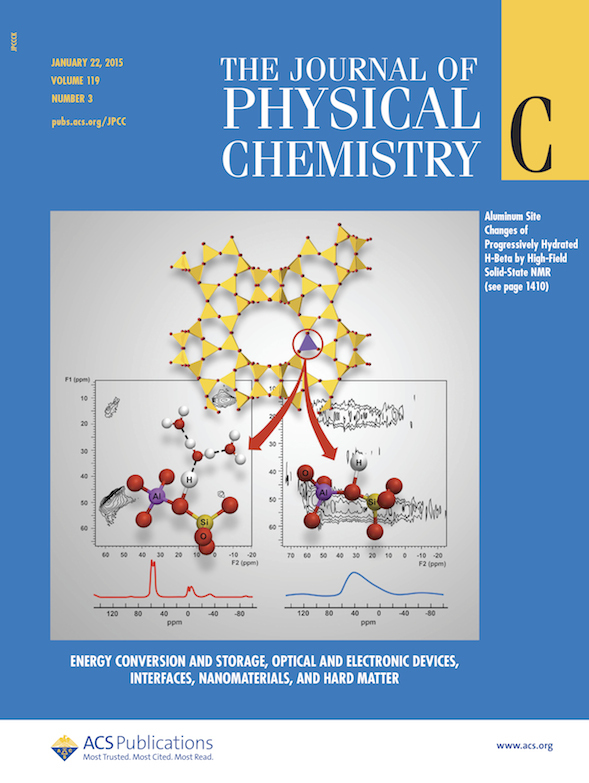 The research was featured on the front of the Journal of Physical Chemistry C. Copyright 2015: American Chemical Society Enlarge Image. Results: Simple improvements to a bland-looking catalyst could change biofuel refining; the challenge is discovering how the catalyst truly works. Led by scientists at Pacific Northwest National Laboratory, a team answered a key question: how does adding water change a dehydrated aluminum- and silicon-based catalyst known as H-Beta zeolite. The team watched as water was added. Spots inside the catalyst's channel—the pores that dot the catalyst's surface—shifted as more water molecules crowd around certain aluminum atoms, which are responsible for the catalyst getting the job done. The channel continued to change as more water was added. "For porous catalysts, the things that are important often happen in the channel," said Dr. Jianzhi Hu, a scientist at PNNL. "Here, only a little bit of the channel is changing. Can we use that change to make a better catalyst? That's what we want to know." Why It Matters: Used extensively in industry today, H-Beta and other zeolites are promising catalysts that turn biomass into transportation fuels, but the activity and stability of this class of materials (see sidebar) is challenging to understand and predict. Of particular interest are the aluminum ions in the zeolite lattice. This study, which was featured on the cover of Journal of Physical Chemistry C, provides insight about the dynamic environment around the aluminum atoms. The results could help design new catalysts and improve existing ones, increasing the efficiency of producing fuels and chemicals alike. Methods: To study the catalyst as it went from dehydrated to hydrated, the team used high-field 850-MHz solid-state nuclear magnetic resonance spectrometer at DOE's EMSL, a national scientific user facility. "You can't get the desired spectral quality (both spectral resolution and line shape) with lower power instruments," said Hu. "The high-field NMR allows this type of investigation." They found that hydrating the catalyst changed the number of oxygen atoms around some aluminum atoms. The extra-framework aluminum started with five oxygens nearby, a state known as penta-coordinated. As water was added, oxygen atoms from water molecules moved in to interact with the penta-site, changing it to sites similar to the octahedral-aluminum sites. More water breaks the framework's aluminum-to-oxygen-to-silicon bond, resulting in dealumination. Further, they discovered that some of the extra-framework aluminum atoms on the catalyst's periphery move back into the framework during rehydration. The move is attributed to the aluminum atom's high mobility and activity, especially in H-Beta zeolite. What's Next? The researchers are continuing to discover the catalyst's inner workings to provide important information for optimizing the performances of zeolites. Sponsor: This research was supported by the U.S. Department of Energy (DOE), Office of Science, Office of Basic Energy Sciences, Division of Chemical Sciences, Geosciences, and Biosciences. User Facility: All of the NMR experiments were performed in EMSL, a national scientific user facility sponsored by the DOE's Office of Biological and Environmental Research and located at PNNL. Zeolites provide a highly regular network of pores and internal cavities where reactions important to biofuel refining and the petrochemical industry occur. Zeolites are composed of a combination of silicon, oxygen, and aluminum atoms. While naturally occurring zeolites are found and mined worldwide, zeolites used as catalysts are industrially synthesized.